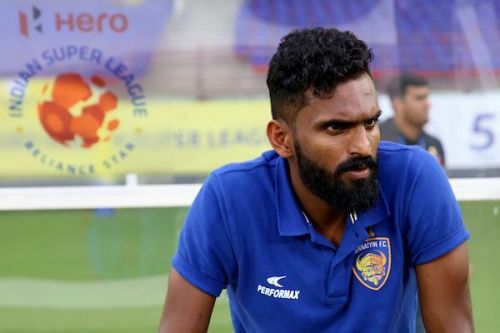 Indian football has been stunned with the latest action of CK Vineeth who has filed an official complaint against the Kerala Blasters fan group Manjappada. The Kerala striker, who played for Blasters in 4 ISL season, was loaned out to Chennaiyin FC in the recent January transfer window. CK Vineeth has lodged a complaint accusing Manjappada of spreading fake news. It has been stated that the fan group is spreading a fake incident of Vineeth behaving harsh and rude to a 7-year old ball boy during the Kerala Blasters-Chennaiyin FC match that happened at Kochi last Friday. The player has accused Manjappada of trying to destroy his football career. The complaint goes against some representatives of Manjappada - one of India's biggest fan clubs. CK Vineeth has said that the attacks on him are not new and that he has faced it previously on social media. This is not the first time the 30-year old has taken to media about negative remarks on the fan club. The player hailing from Kannur further stated that Manjappada is the best fan club in the country only in numbers and not in terms of action, as the 'Yellow Army' is poor in treating its players. Vineeth, once a local fan favorite, had been widely criticized for his poor performances earlier this season. The former Bengaluru FC player has also revealed that leaving Blasters was not his decision and that he was loaned to the current champions after returning from vacation in January. The recent events have tainted Manjappada to an extent as they were nominated for the 'Best Fan Club in India' award for a second consecutive time. The relation between the fans and club has not been at the best this season, as they have criticized the management of poor decisions and have even boycotted games as a result.